There are many ways to make gravy for a turkey or chicken dinner, including some shortcuts using butter instead of pan drippings along with chicken or turkey stock. 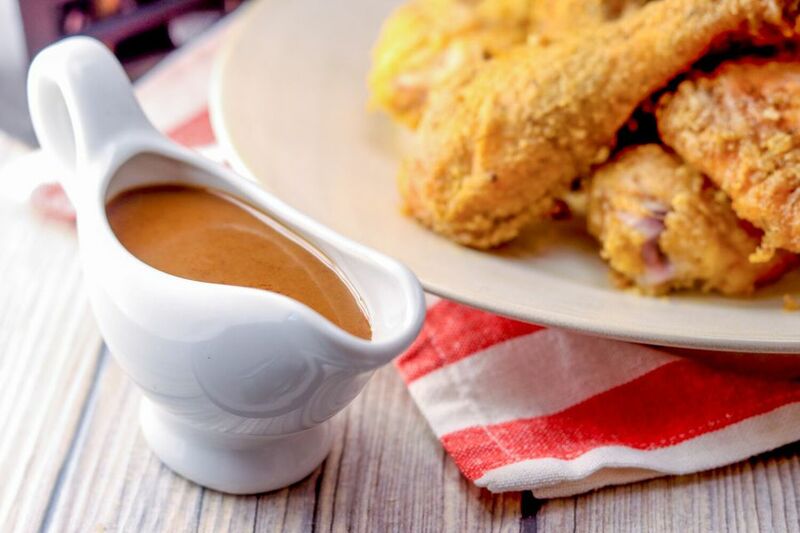 This is a recipe for a classic turkey gravy made with pan drippings, flour, and water or stock. Purchased chicken or turkey stock may be used, but it should be a good quality stock and low in sodium or unsalted. Use this recipe for roasted turkey, chicken, or Cornish game hens. The recipe can easily be scaled up or down for a large roasted turkey or smaller hens. It depends on how much fat you have in the drippings. A small amount of butter can be added to the turkey or chicken fat if you do not have 1/4 cup. See the tips and variations below the recipe for some optional additions and flavor ideas. Pour the turkey or chicken pan drippings into a 2-cup measuring cup or gravy separator and skim the fat off. Put about 1/4 cup of the fat into a saucepan. Stir in 1/4 cup of all-purpose flour. Discard any remaining skimmed fat. Add enough water to the liquids left in the measuring cup to make 2 cups of liquid. Pour the 2 cups of liquid into the flour and fat mixture. Cook, stirring, until thickened and bubbling. Continue cooking for about 1 minute, stirring constantly. Add kosher salt and freshly ground black pepper to taste. To make giblet gravy, put the neck, heart, and liver in a saucepan and cover with salt-free or very low sodium stock or water. Simmer over low heat for about 1 1/2 hours. Drain the giblets, and chop the meat (discard the cooking liquid and gristle, and remove meat from the neck). Add the chopped giblets to the saucepan with the 1/4 cup of fat, and proceed with the recipe. For richer flavor, use a good quality chicken or turkey stock (unsalted or low sodium) instead of water. After the gravy has thickened, add 1/4 cup of heavy cream, 1 teaspoon fresh finely chopped sage, 1/2 teaspoon of fresh finely minced rosemary, and 1 teaspoon fresh finely chopped thyme. Cook, stirring, for about 1 minute longer. Add kosher salt and freshly ground black pepper, to taste. Add 2 tablespoons of dry white wine or Madeira to the saucepan along with the 2 cups of liquid, and proceed with the recipe.